If you want to be totally brought up-to-date on Commercial General Liability, this is the series for you and your staff! 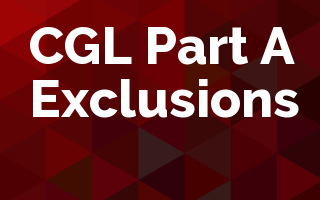 CGL Exclusions. The Whole Story! This series of five one-hour webinars details all the exclusions found in Coverage Part A of the Commercial General Liability policy. And coverage in the CGL is built from the exclusions. Session 1 – Coverage A Exclusions a., b. and c .
Session 2 – Coverage A Exclusions d., e. and f.
Session 3 – Coverage A Exclusions g., h., and i. Session 4 – Coverage A Exclusions j., k., l., and m.
Session 5 – Coverage A Exclusions n., o., p., and q. Many students do no realize that most of the coverage under A is made in the Exclusions, so these webinars detail all the relevant exclusions. With this series of webinars, you will be much better able to dissect Coverage Part A of the CGL and make or defend your coverage findings.